Australia’s privacy watchdog has opened an investigation into Facebook in the wake of the Cambridge Analytica data misuse scandal. Yesterday Facebook revealed that more users than previously thought could have had their personal information passed to the company back in 2014 — saying as many as 87 million Facebook users could have had their data “improperly shared”, thereby confirming the testimony of ex-Cambridge Analytica employee, Chris Wylie, who last month told a UK parliamentary committee he believed that substantially more than 50M Facebook users had had their information swiped. And while most of these Facebook users are located in the US, multiple millions are not. The company confirmed the international split yesterday in a blog post — including that 1 million+ of the total are UK users; more than 620k are Canadian; and more than 300k are Australian. Though in tiny grey lettering at the bottom of the graphic Facebook caveats that these figures are merely its “best estimates” of the maximum number of affected users. 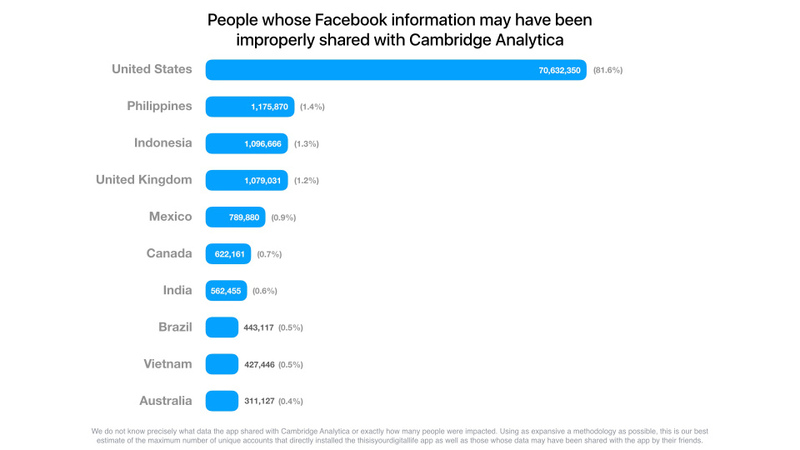 After the US, the largest proportion of Facebook users affected by the data leakage were in the Philippines and Indonesia. In a statement today the Australian watchdog (OAIC) said it has opened a formal investigation into Facebook. We’ve reached out to the National Privacy Commission in the Philippines for a reaction to the Cambridge Analytica revelations. Update: The agency has now put out a statement in which privacy commissioner Raymund Enriquez Liboroit states that Facebook told it 558 Filipino users had installed the personality quiz app that was used by CA as the route to harvest Facebook friend data — and ultimately to pull data on up to 1,175,312 more local users. Indonesia does not yet have a comprehensive regulation protecting personal data — and concerned consumers in the country can but hope this latest Facebook privacy scandal will act as a catalyst for change. Elsewhere, the Office of the Privacy Commissioner of Canada announced that it was opening a formal investigation into Facebook on March 26. In an op-ed, privacy commissioner Daniel Therrien also wrote that the Cambridge Analytica scandal underscored deficiencies in the country’s privacy laws. Back in Europe, the UK’s data watchdog, the ICO, was already investigating Facebook as part of a wider investigation into data analytics for political purposes which it kicked off in May 2017. We’ve asked if the agency intends to also open a second investigation into Facebook in light of the 1M+ UK users affected by the CA data mishandling — and will update this post with any response. Update: A spokesperson for the ICO said is investigating 30 organizations, including Facebook, as part of its probe into the use of personal data and analytics by political campaigns, parties, social media companies and other commercial actors. The UK’s information commissioner, Elizabeth Denham, added in a statement: “Facebook has been co-operating with us and, while I am pleased with the changes they are making, it is too early to say whether they are sufficient under the law. Late last month Denham revealed the watchdog had been looking into Facebook’s partner category service as part of its political probe, examining how the company used third party data to inform targeted advertising. In a statement then she said she had raised the service as “a significant area of concern” with Facebook — and welcomed Facebook’s decision to shutter it. And last month the ICO was also granted a warrant to enter and search Cambridge Analytica’s offices. Reacting to the Cambridge Analytica scandal last month, Andrea Jelinek, chair of the European Union’s influential data protection body, the Article 29 Working Party — which is made up of reps of all the national DPAs — said the group would be supporting the ICO’s investigation. Also last month the European Commission’s justice and consumer affairs commissioner, Vera Jourova, told the BBC that the executive body would like to see new legislation in the US to strengthen data protection. In Europe the incoming General Data Protection Regulation (GDPR) beefs up the enforcement of privacy rules with tighter requirements on how data is handled and a new regime of tougher fines for violations. The EC has a specific lever to press the US on this point — in the form of the Privacy Shield arrangement which simplifies the process of authorizing personal data flows between the EU and the US by allowing companies to self-certify their adherence to a set of privacy principles. Both Facebook and Cambridge Analytica are signatories to Privacy Shield — and are currently listed as ‘active participants’ in the framework (for now). A spokesman for Jourova confirmed that listed companies can be removed by the FTC — although he also noted that the Cambridge Analytica data misuse pre-dates Privacy Shield (which was signed in August 2016). “The FTC has made use of this possibility already a number of times under the Privacy Shield,” he added of the possibility of listed companies being removed from the framework. The Privacy Shield mechanism was negotiated as a direct replacement for Safe Harbor after Europe’s top court struck down that earlier arrangement, in 2015, in the wake of the Snowden disclosures about US government mass surveillance programs. The Privacy Shield arrangement has its critics. It also includes a regime of annual reviews. In the BBC interview Jourova made a point of reminding the US that the arrangement — which thousands of companies rely on to keep their data flows moving — remains under constant review. She also said she would be writing to Facebook seeking answers about the Cambridge Analytica scandal. “What we want from Facebook is to obey and to respect the European laws,” she added. For its part Facebook caused confusion about its commitment to raising data protection standards on its platform this week after founder Mark Zuckerberg told a Reuters journalist that it will not be universally applying GDPR for all its users — given the law applies for all Facebook’s international users that essentially means the company intends to apply a lower privacy standard for North American users (whose data is processed in the US, rather than in Ireland where its international HQ is located, within the EU). At this stage it remains unclear whether Facebook will universally apply GDPR or not. Zuckerberg’s remarks suggest there will indeed be some discrepancies in how it handles data protection for different users — what those differences will be remains to be seen. In remarks made on Twitter today, Jourova described the growing scale of the data misuse scandal as “very worrying” — and said the Commission “will watch closely” how the company’s application of GDPR “will work in practice”. The UK’s digital minister, Matt Hancock, has also tweeted about the data misuse scandal — saying he will be meeting Facebook representatives next week and expects the company “to explain why they put the data of over a million of our citizens at risk”. “This is completely unacceptable, and they must demonstrate this won’t happen again,” Hancock added. Yesterday the Facebook founder also revealed that search tools on the platform had made it possible for “malicious actors” to discover the identities and collect information on most of its 2 billion users worldwide — essentially confessing to yet another massive data leak. He said Facebook had now disabled the tool. As with the millions of Facebook users whose data was improperly passed to Cambridge Analytica, the company is unlikely to be able to precisely confirm the full extent of how the search loophole was exploited to leak personal data. Nor will it be able to delete any of the personal information that was maliciously swiped.